When the goal is to have a high quality selection of hydroponic lettuce production and herb crops, we recommend the NFT channel system. Diversity in cropping, ease of management, and opportunity for expansion are desired, make the CropKing NFT hydroponics growing system a great investment for the future of your business. The NFT re-circulating system efficiently reduces water and nutrient usage. The channel is extruded, food grade PVC with removable top caps for ease of harvest and cleaning. Each channel rests on a steel table with integrated drain lines to provide a completely closed system that provides simple and straightforward management. In an effort to provide growers with the highest quality system, we continue to test and improve our NFT growing systems. Linked with system improvement, we also carefully consider whether the PVC hydroponic systems and equipment will be the most efficient and economical for growers. CropKing is genuinely concerned about our customer's "bottom line" because a profitable grower is our best advertisement! Keeping the plants in an ideal temperature and humidity range is crucial to optimizing growth and maintaining plant health. If the greenhouse were not equipped with a cooling system, sunlight would quickly increase temperatures above 100 degrees. High temperatures reduce crop growth and quality and create undesirable working conditions. CropKing greenhouses and hydroponic lettuce production systems are designed to grow vegetables year-round, so equipment is required to keep the greenhouse cool. Exhaust fans in the north end of the greenhouse pull air from the back of the greenhouse across the evaporative pads or a "wet wall". This wall lowers the temperature of the incoming air through the evaporation of water. Evaporative cooling is common and one of the most cost effective methods for reducing the air temperature inside a greenhouse. While air conditioning or refrigeration systems can be used, their installation and operating costs are usually prohibitive. The greenhouse system includes exhaust fans and an evaporative pad system. A Glacier-Cor PVC open top evaporative wet wall pad with a self-contained water distribution system (so no pump tank is needed) is positioned on the inside of the south end of the house. The heavy duty greenhouse grade American Coolair fans include slant wall housings, fan guards, aluminum shutters, motors, and all necessary hardware. When the exhaust fans come on in the north wall of the greenhouse, an automatic vent door opens to allow air to enter greenhouse on the south end of the greenhouse. A rack and pinion driven vent door will open when fans are running and close securely when the fans are not running. The vent door has a gear driven motor with limit switches and is covered with 8 mm twin wall polycarbonate with an extruded aluminum frame. The proportional opening and closing of power vent door is controlled by the iGrow 1400 environmental control system to integrate with the rest of the climate management system. Air circulation is important for a healthy greenhouse environment and high quality produce. Air circulating through the foliage of a plant brings a much needed supply of fresh carbon dioxide to the plant, and helps prevent stagnant humid air that can lead to disease issus. The central component in the air circulation system in our greenhouse are vertical air flow (VAF) fans. They function to pull air up through the crop and in the bottom of the fan, then out the top of the fan and down onto the crop. These VAF fans are specifically designed to produce an air movement pattern that increases flow across leaves to increase photosynthesis and reduce condensation on leaf. Working in conjunction with the VAF to bring in outside air and remove warm, humid greenhouse air is a motorized gable intake shutter on the south end of the greenhouse with a shutter and gable fan and shutter on the north end of the greenhouse. This combination of shutters and fan can pull cool air in the south end and exhaust warm out out the north end of the greenhouse. Unit heaters placed at both ends of the greenhouse blow warm air, which is then circulated through the action of the VAF fans in the house. 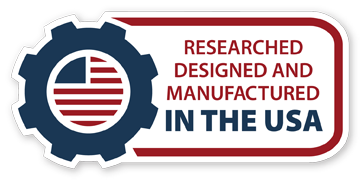 Each bay or unit includes two Modine PDP 80% efficient standard unit heaters (10 year limited warranty) with 180 degrees rotating power exhauster and aluminized steel heat exchanger and burners. Galvanized steel heater hangers are included. For an additional charge, we suggest that in cold climates, one of the heaters can be replaced with a 93% efficient unit heater. While this Modine Effinity93 heater is more expensive, studies have shown that it can pay for itself in less than two years in typical northern climates. Since only one of theaters runs during the majority of the heating season, we recommend only upgrading one heater per bay. The iGrow1400 Control System is the brain and nervous system of the greenhouse. This dedicated unit controls all the environmental equipment in the greenhouse's PVC hydroponic system such as fans, shutters, heaters, vent door, wet wall, lights and CO2 burners. Due to rapidly changing environments in the greenhouse, specialized greenhouse controllers are critical to maintaining optimum conditions. The computer controller measures both temperature and humidity and adjusts to the equipment to maintain the correct set points. By maintaining tight tolerances on the environment both night and day, significant energy savings can be achieved over simpler thermostat control. The iGrow control system has onscreen programming for easy tracking and adjustment of the environment. There are 12 outputs with LED status display indicators and manual over-ride switches. With the addition of "slave units" the iGrow system can be expanded when extra inputs are needed for additional greenhouse space. For ease of installation, CropKing provides a pre-wired electrical panel that has been tailored to your greenhouse needs. The panel will arrive pre-mounted, and consists of a breaker panel, a relay box and the iGrow controller(s). All of these are prewired together and terminal strips are provided to connect the greenhouse equipment to the controller. Since the computer controller only provides low power outputs, high amperage equipment such as motors and pumps need to be controlled with line voltage relays. The wiring for this system can be complicated and can be misunderstood by electricians not experienced in greenhouse installations. CropKing simplifies these electrical issues with their prewired electrical panel. Our panels and boxes are interior grade NEMA enclosures to be most appropriate for a hydroponic greenhouse operation. Keep in mind that power requirements of a greenhouse depend on the size of the greenhouse and whether grow lights are being installed. Note: Please check with the local electric codes. While we use UL listed components in our electrical panels, some codes require the constructed panel itself to be UL listed. CropKing NFT Growing Channel: 2 piece extruded PVC growing channels with base and removable pre-punched top cap. Two types of end caps: one solid, one spouted per channel with anti-drip drainage design. Holes in top cap are pre-punched on 8" centers, or a different punch spacing of the customer's preference. Nutrient Delivery and Return System: High efficiency circulation pump(s) and includes main poly feed line with feeder tubes, punch, valves, filter, hardware and 4" opaque drain line for nutrient return to the reservoir. CropKing NFT Fertroller System: Pre-wired microprocessor with pH and EC control. Two nutrient injector pumps (for two nutrient concentrates) and acid injection pump (pre-assembled, mounted and tested). Three concentrate tanks and plumbing kit are also included. NFT Channel Supports: Gatorshield galvanized steel frame for supporting the growing channels, which include all connecting hardware. Nursery Seedling System: Lettuce nursery for seedlings -2 white PVC nurseries and seedling trays to be located in the front of each bay. Nutrient Reservoir: Due to high shipping costs from our warehouse in OH, CropKing recommends that growers purchase UV stabilized plastic underground tanks for their nutrient reservoirs from local tank suppliers. Therefore, reservoirs are generally not included in commercial leafy crop greenhouse packages. The Nutrient Film Technique (NFT) is a growing system that constantly recirculates a thin film (or stream) of nutrient rich water through food grade PVC for growing leaf crops such as lettuces and smaller herbs. 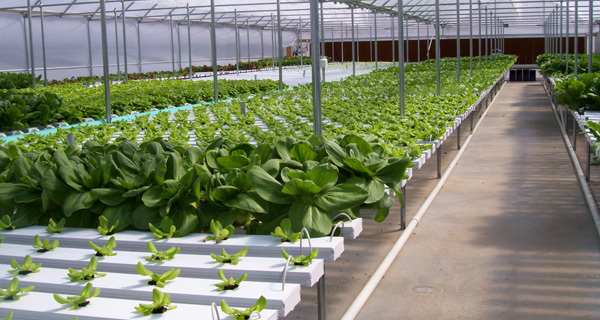 The NFT channel system uses water very efficiently because it is recirculates the water between the growing channels and a reservoir, generally buried for space efficiency and temperature moderation. Nutrient solution flow to the channels is carried out using a feed pump and return to the reservoir is by gravity. CropKing's NFT System includes an extra nutrient feed pump as a back-up. While this is a costly pump, it is an important "insurance policy" to be able to immediately install in case of primary pump failure. 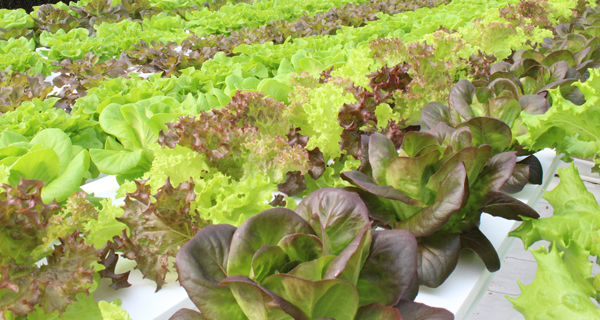 There are two types of growing areas included with your NFT system. First are nurseries where seedlings spend the first 10-20 days at close spacing before being transplanted into the growing channel. The growing channels themselves have molded end caps that fit on both ends of the channel with the drain end cap having a spout to fit in the return line. With two end caps and punches in the top caps that fit tightly around the transplanted seedling media, light can be excluded from the system. This is crucial because light and nutrient solution are the perfect environment for growing algae, which can attract pests and clog lines and filters. The top caps are removable for ease of cleaning. The PVC hydroponic system top covers are commonly punced with 1" squared holes on 8" centers; however, varied spacing of the top cap punch can accomodate different crops or ages of harvest. The CropKing NFT growing system also includes a very important piece of equipment called a Fertroller. The Fertroller continually samples and tests the nutrient solution from the underground tank to monitor the pH and EC (level of fertilizer) so that changes can be made in the solution whenever there are deviations from set targets. Included in greenhouse package is a handheld BlueLab pH and EC monitor along with necessary conductivity standard solutions and pH calibration standards. Additionally, the nutrient mixing pump, min/max thermometer(2), and white ground cover for floor under beds are included. A Berry vacuum seeder is also included with two bay and larger greenhouse packages to eliminate time consuming hand seeding. To assist growers in beginning operation, CropKing also provides fertilizer and supplies for early production. The hydroponic nutrient solution in the greenhouse is based on a custom recipe which uses the water at your greenhouse as the base. Included in the commerical greenhouse package is an estimated one year supply of fertilizer along with the 1 inch Grodan rockwool cubes and seeds to plant out the greenhouse for the first three crop rotations. Purchasing the first year of fertilizer with your greenhouse shipment can help to save on freight costs and assist with cash flow until your first crops are in production and saleable. C02 Enrichment and Control System Johnson CO2 generator, one per unit, electronic, remote C02 monitor with control package pre-wired and programmed to be operated by the iGrow 1400 environmental controller. Sensaphone Sensaphone Model 1104 and Sensaphone Remote Temperature Sensor. Shade Cloth 40% white exterior shade cloth including tie down kit. Note:50% white shade cloth or aluminet are also available for higher light and/or temperature regions. Insect Exclusion System includes a "screen room" extending the south end of the greenhouse by 8 ft. This additional 8' of greenhouse is covered with thrips insect screening so that the air pulled into the power vent door and through the wet wall has been screened to stop insects from entering in the back of the greenhouse. Prevention is the most effective method of greenhouse insect control. The insect exclusion system price includes the access door into this 8' extension for maintenance of the wet wall. Also included is an additional entrance door and air curtain to turn a customer-supplied head house into an air-locked greenhouse entry. This reduces the chance of insect entering through the main entrance of greenhouse. Steel Endwalls and Sidewalls CropKing's galvanized structural steel endwall package includes three steel framed endwalls and two steel sidewall baseboards made of structural 1 1/2in. x 3 in. galvanized C channel, aluminum brackets, hardware and additional end wall bracing and connecting hardware. Pricing per project. High Efficiency Unit Heater Upgrade This option is to replace the primary (one that comes on first) of the two 80% efficient unit heaters in each bay with a 93% efficient separated combustion , high efficiency Modine PTC-180 Effinity93 Unit heater. Pricing for this upgrade is based on heater size and location.